The young woman stumbled into a mobile heath unit parked in a northeast Toronto factory district. She was obviously ill, and everyone in the van rushed to help her. But she didn’t speak English, and no one could speak her language, either. “This woman struggled to come to us for help, but no one spoke her dialect,̶`; recalls Dr. Miriam Garfinkle, medical director of the Immigrant Women’s Health Centre. Using sign language, those assisting the young woman were eventually able to determine what her needs were and get her treatment for a neurological problem. Language is just one of the several barriers Garfinkle and other doctors must overcome in their efforts to provide immigrant woman with reproductive health services at the College Street centre. The mobile clinic, which once traveled around the city, is no longer on the road. A fundraising campaign is now under way to replace it. In addition to health care, the centre offers information about sexually transmitted diseases, breast and cervical cancer, birth control and about their rights as Canadian women. “We help them to understand that it is different here for women,” says Garfinkle. “They may come from a culture that is very different from this one. We want them to understand, know their rights and have confidence so that they can overcome some of the barriers that might prevent them from getting the health care they need,” says Garfinkle. 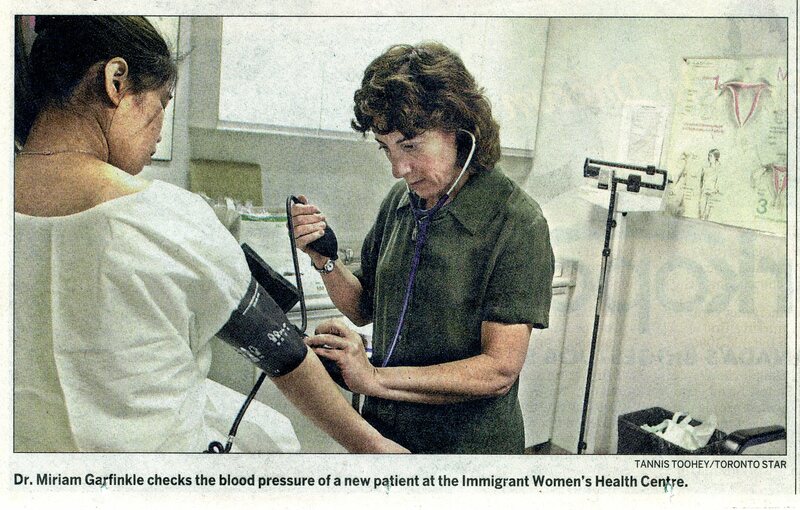 The 48-year-old doctor has been working with immigrant women for 20 years, since graduating from medical school. Barriers to health care for immigrants must be addressed and removed, says Ilene Hyman, a research scientist and assistant professor in the public health sciences department at the University of Toronto. Hyman is one of the authors of the Ontario Women’s Health Council Report, published last February, on how immigrant and visible-minority women fare in the health-care system. She found they are generally healthy when they arrive but eventually, their health deteriorates. Several studies suggest the stress of re-settlement, language difficulties and the challenge of learning how the system works are preventing immigrant women from obtaining health care. Hyman says there is a debate over the best way to overcome the barriers immigrants face. She favors a combination of specialized health services for immigrants and making mainstream health care more flexible. “Screening for breast cancer and cervical cancer, for example, are best offered by community-based health-care centres,” Hyman says. Such screening is offered by Scadding Court Cross-Cultural Health Services, which concentrates on Toronto’s Chinese community. Here, new Canadians find a health-care clinic with family doctors from St. Michael’s hospital who speak Mandarin and Cantonese, a registered nurse, chiropractors, nutrition assistants and ophthalmologists from Mount Sinai Hospital. Scadding Court has also provided Canadian work experience on a volunteer basis for foreign-trained health-care professionals, such Xiohong Song. A doctor in China, Song, 42, is not yet accredited to practise medicine in Canada. She was part of a recent cervical cancer research project at Scadding Court. When that project ended, she found part-time work with Joy Luck Women’s Health, a breast cancer screening program for Chinese seniors – a joint project between South Riverdale Community Health Centre and Mount Sinai Hospital. Her job is to enter the survey results on a database and apply statistical analysis. Song and her husband came to Canada in 1997 with their 9-year-old son. She took a “survival job” as counter help in a restaurant, and later in a factory. But when she began volunteering and using her medical knowledge, even in a limited way, Song became hopeful again.